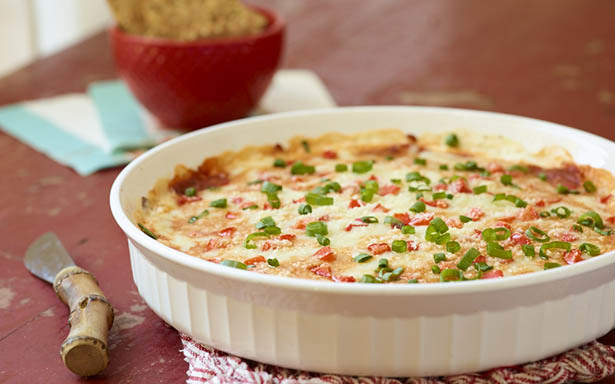 Spice up your next tailgate or party with this cheesy, delectable pizza dip. Combine cream cheese, sour cream and oregano in bowl; stir until smooth. Spread cream cheese mixture evenly into 9-inch pie plate or quiche pan. Spread pizza sauce over cream cheese mixture. Top with cheese and peppers. Bake 20 minutes or until hot and bubbly. Top with green onions. Serve with crisp flatbread, breadsticks or toasted Italian bread.